In most homes, the kitchen is the center of constant activity. It's where you prepare your meals, where children do their homework, and pets watch everything that falls on the ground! As kitchens are probably the busiest part of your home, it is necessary to maintain good hygiene in this area. After all, you want to keep your food safe and the germs and diseases at bay. Take a look at some easy rules to maintain kitchen hygiene. Your kitchen accumulates more bacteria than your bathroom, so maintaining the hygiene of the kitchen is paramount to your health and that of yours. These are the aspects that you have to take into account to have a kitchen free of bacteria. This sounds obvious and simple, but it's probably the most effective thing you can do to maintain good hygiene in the kitchen. Many diseases are spread from person to person when someone does not wash their hands before handling food. Therefore, before touching any type of food, whether raw or cooked, always make sure to wash your hands. Use a mild soap and warm water and rub your hands, especially between your fingers and under your nails, for at least 50 seconds. Rinse well and use a clean paper towel to dry your hands. May not look like it, but dirty and contaminated sponges and tea towels are the perfect host for rapidly growing bacteria. Regularly soak tea towels and sponges for a few minutes in a solution of 1 teaspoon of bleach and a liter of warm water to clean and disinfect them. Change the dishcloths and sponges after a few months, especially if they continue to smell bad despite disinfection. Countertops in the kitchen are very active during the day. Between supermarket bags, crumbs, spills, tasks and projects of art and crafts, your countertop has a pretty hard life. Therefore, it is important thoroughly clean this area of ​​the kitchen every week with detergent and hot water or a solution of water and bleach. Let the solution settle for approximately 10 minutes and then clean with disposable paper towels. The average kitchen cutting board has 200% more faucal bacteria than a toilet. The cutting boards can be, in fact, bacteria foci, so it is essential to keep them clean. After each use, wash the cutting board with warm soapy water, rinse thoroughly and clean with a paper towel. 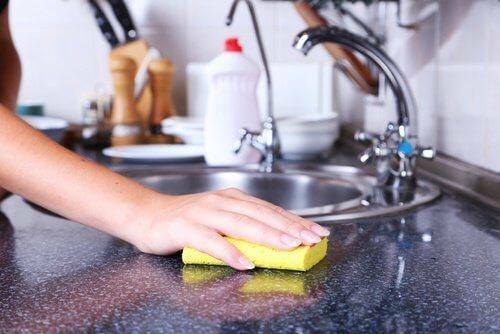 Once a week, disinfect your cutting board with a solution of 1 tablespoon of bleach per 4 liters of water. Pour the solution gently on the cutting board, let it stand for about five minutes, rinse with warm water and dry with a paper towel. Your refrigerator can be a breeding ground for bacteria if you do not clean it regularly. Clean any spills inside the fridge immediately, use a tablespoon of warm water and a small stream of dishwashing liquid every week. You can also use a solution with 2 tablespoons of baking soda in 1 liter of warm water to clean your fridge. Cleaning your fridge regularly also allows you to detect hidden items that have already expired. Be sure to throw away all foods that have passed their expiration date. It also cleans vegetables or leftovers from damaged foods and products. As a general rule, you should also thoroughly clean your fridge once every three months or so. For effective cleaning, remove all shelves and clean the interior walls with hot water and a mild liquid detergent. Rinse with water and clean with paper towels. You can clean the shelves in the sink with hot water and detergent as well. Be sure to clean up any stain or spill. Always be sure to separate raw meat, seafood and poultry from other items in your shopping cart, grocery bags and the refrigerator. It also designates a cutting board only for these items to avoid cross-contamination with fruits and vegetables. If you are freezing the meat for later use, place it in plastic freezer bags, seal and store it in the freezer until ready to use. When you need to thaw meat, remember to do it at night, in a bowl of cold water or in the microwave, never at room temperature on the kitchen counter or in the sink. Never dry your hands with a paper towel that was previously used to clean raw meat or raw meat juices. Doing so can transfer bacteria from the juices to your hands, and eventually spread throughout the house. Store shelves are full of dirt and bacteria that can cause foodborne illness. Therefore, it is vital to clean fresh products as soon as you take them home. Clean fruits and vegetables that have thick skin with a vegetable brush to eliminate harmful microbes. Vegetables such as broccoli and cauliflower should be soaked in water for approximately two minutes before cleaning. To clean the leafy vegetables, immerse them in a large container with cold water or a solution of water and vinegar for about five minutes. Rinse well and drain in a colander. Even with a good daily or weekly cleaning of the kitchen there will be areas that are not saved from accumulating dust, steam and grease since the kitchen is frequently exposed to these elements. That's why we recommend that once a year you do a thorough cleaning of your kitchen to prevent your appliances and furniture from deteriorating as a result. Request without commitment a budget for thorough cleaning of the kitchen so that the team of Housekeeping Agency disinfect and leave your kitchen impeccable.